The world’s largest and most comprehensive collection of art and artifacts of the American West. The Thomas Gilcrease Institute of American History and Art—commonly known as Gilcrease Museum—in Tulsa, Oklahoma, houses the world’s largest and most comprehensive collection of art and artifacts of the American West. This unparalleled collection of Native American art includes more than 12,000 paintings, drawings, prints and sculptures. The museum partnered with Urban Insight to envision and create its online collections website. 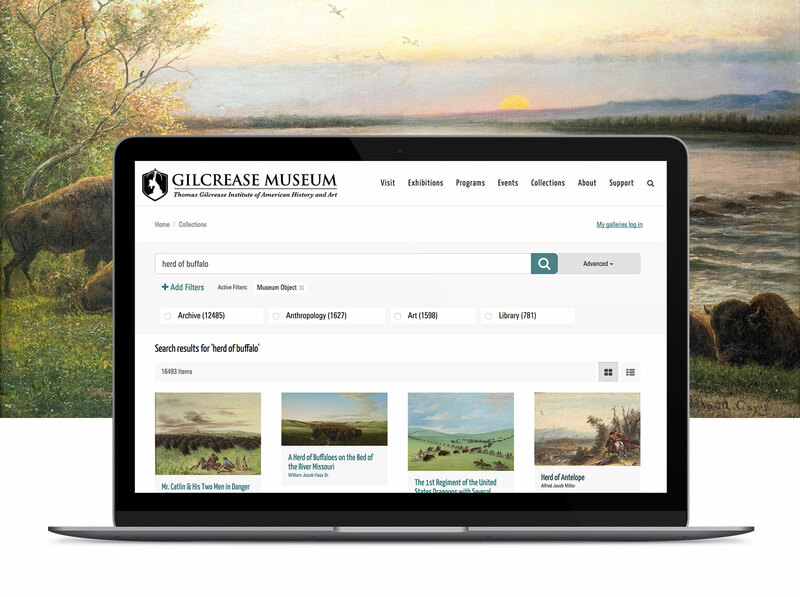 The Gilcrease Museum wanted a full redesign of its public facing website to better communicate with an online audience and showcase its legendary collection. 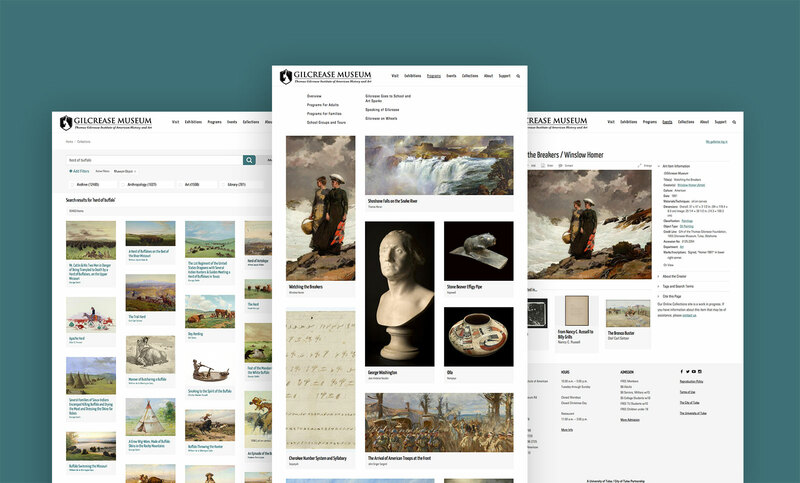 They needed a robust solution for visitors to explore their extensive collection of art and anthropological and archived material through an intuitive search interface. The new online collections website was built using the open source software platforms Drupal and Apache Solr search. These enterprise level open source tools were integrated with Piction asset management software and The Museum System’s (TMS) Gallery Systems, used by the museum’s Digital Collection team to organize both images and metadata for the various object records. Museum staff are able to continue using their existing workflow to curate objects with the confidence that the correct metadata, images, and expert commentary are published on the website. 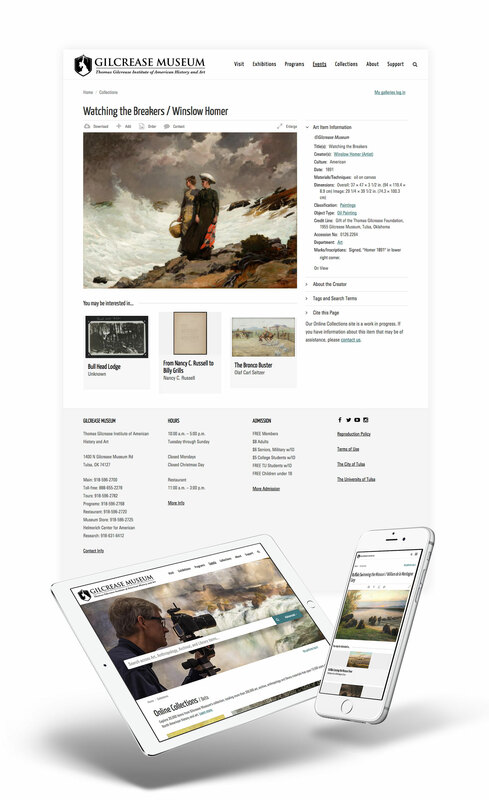 Thousands of art objects and cultural artifacts that were previously only available to dedicated researchers can now be viewed by a wider audience in an elegant, mobile responsive online collection.